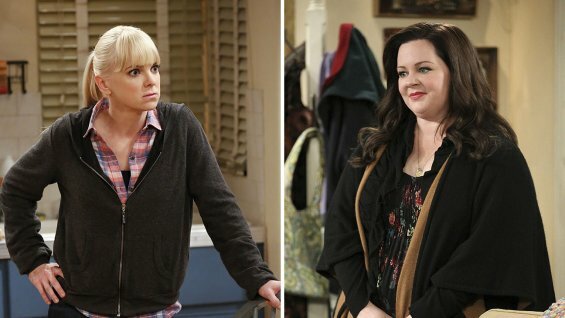 Updated: 3/12/15: Official word has come in that 2 Broke Girls has joined Mom and Mike & Molly in the renewal circuit. And there is an official release now indicating that all three series have been renewed. This will be the fifth season for the Kat Dennings and Beth Behr sitcom. Mom stars Anna Faris and Allison Janney and has been a solid performer this season for the network. A surprising storyline involving the death of Christy’s (Faris) dad and Bonnie’s (Janney) ex-husband Alvin (Kevin Pollack) has been critically acclaimed and well watched. Mike & Molly still is a dependable series for CBS, with Melissa McCarthy’s film career still helping give the series viewers every week. During its current fifth season, the series has aired its 100th episode, a rare feat for sitcoms in the past few years.